Something unusual happened to me recently. A new friendship turned ugly. Nasty accusations got made. Yours truly got to play chief antagonist in a real-life Lindsay Lohan drama. Normally, I'd take a whiff and move on. But my testosterone levels have sunk to record lows lately. I blame motherhood. So I cried copious tears, while cradling a bottle of vino and ranting down the phone to an unsuspecting close friend. A whole hour later I realised the poor man had slid off to watch TV. Not wishing to bother him with my theatrics, I plonked myself on the sofa pleasantly enquiring about the sword-wielding blonde gracing the silver screen. It's Kill Bill, he said. A movie about a woman who is betrayed by everyone she loves and trusts. Cue: more floods of tears followed by a prompt end to the day. Sometimes in life you need things that just work. Like unconditional love. Solid friendships. Trusted kitchen appliances. Failsafe recipes. The things that you care for dearly. That take anything you throw at them. Last forever. And can be relied upon come rain or shine. This recipe for Prawn and Pea Pulao is one that has survived through thick and thin with me. Quick dinner for sister. Check. Lunch for toddler playdate. Check. Centre piece for dinner party. Check check. I've left the peas out once, taken the tomatoes out another time and used yoghurt instead, mixed in some fresh coriander and each time the result is tremendous. The trick is to cook the rice separately while the prawn masala bubbles away and then mix the two together. This is cheating, of course (this isn't), but it speeds up the cooking time dramatically and the end result is almost foolproof in its fluffy perfection. To be eaten with true friends and plain yoghurt. Naturally. Wash the rice and cook it in a large pan or rice cooker. In the meantime, slice the onion finely, mince finely or puree the ginger and garlic together and wash and clean the prawns. Unless they are ready prepared like the ones I use! In a large pan, bring the oil/ghee to heat over a high flame. When it’s hot, add the whole spices and as they sizzle up the onions, ginger and garlic. Saute the whole lot for about five minutes until it starts going golden, then roughly chop the tomato and throw it in along with the turmeric and chilli powders. Fry this lot for about five minutes, then simmer for another five. Next, stir in the prawns with the peas and cook until the prawns go pink and firm. Add salt now and check to make sure it’s well salty. Then simply stir in the cooked rice and serve. You can add other vegetables like peas, potatoes, cauliflower just make sure they are cooked when you mix the rice in. Also, if using yoghurt use a full fat version and add it instead of the tomatoes. *big hug* Hope everything’s now ok! This recipe sounds fantastic – excellent for a weekday! God this looks amazing. Yum. The flavors sound delicious. What would you recommend as a substitute for prawns, so that it can be made vegetarian. Thank you! I would want to cook and eat this at the end of a horrid day too. Hope you feel better. coming to the recipe part, i too cook rice separately if i want some fluffy, gorgeous looking rice dish. will try veggie version with yougurt soon. Would a bit of saffron go well with this as well? And ignore the nasty people! Give the nasty friend a big dose of red chili powder. Feel better. I totally understand what you went through… I have had my share of such people in life 🙁 But yeah… soon you realize that life has a lot more to it! A cup of ice cream would have been a more suitable post here :). But I hope the wonderful pulao did its bit of magic and you got over the bad patch. I am a friend of Johanna, a blogger and also a published food writer (so I know more or less where copyrights start and end). When Johanna told her story I felt so sorry, I didn’t expect something like this to happen in New Zealand (such a small country!). I am not sure of the situation in the UK, but here bloggers are just starting to find their feet, so I would like to call all for solidarity and talk openly about these issues, so thank you for your support to Johanna and the others :-). good to know your blog, I am learning to cook Indian dishes, I am a still ‘timid’ when handling spices, but I am getting there, slowly! Lol i’d better get some new scales coz i’ll be getting fat from all this good food! Sorry to hear about your relationship… Thanks for keeping the blog alive through adversity. Good to see you back! Follow your blog regularly but this my first comment 🙂 This is so my kinda pulao. I do a near similar one where I mix everything up on the stove and then bung it into the microwave for 15 minutes and voila! Love this with chicken or egg curry. You haven’t missed on a recipe yet… I’m sure that this one is great! We are planning an Indian food night for some friends, are are going to try and incorporate only your dishes! first off im chinese and iâ€™ve eaten only chinese food all my life, the idea of spices freaks me out, but my mother bought me your lovely book a month before i left to study in india, i have mastered 5 recipes and i loooove the lentil ones, i have on serious problem though, i am in karnataka state india and language is a huge barrier for me as i do not know hindi, almost all your dal recipes require asafoetida and i keep asking the shop keep but he has no idea what im on about, i do so love the spice and you were right even if foul smelling it is rather yum in the right amounts, please could someone tell me how to say the spice name in hindi? or kanada?? Wow this dish sounds (and looks) delicious! You can’t go wrong with fresh prawns. @Francoise : If you still havenâ€™t got an answer – ‘asafoetida’ is called ‘hing’ – ask for that in the shops . A very yummy treat..:) I am surely gonna try making this…however, I do hope my limited cooking skills help out. mice 🙂 thanks for sharing. Another great dish! I made this tonight and it was a hit at the dinner table. Thanks for the recipe. 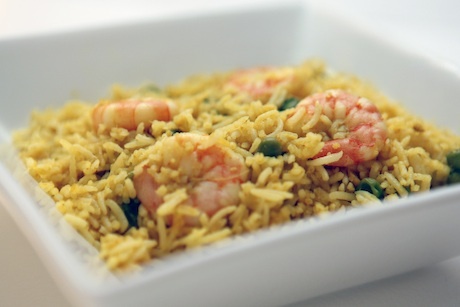 nice Prawn Pulao recipe. Thanks for sharing. The coments page is too long. I just wanted the recipe, and there is no print-out ikon. I came here when I did a search on Google for “healthy indian food blogs” .After reading your whole story,the only thing I would like to say is “Life is too small to even think about these nasty people.Ignore them Lady:)” BTW,I make the shrimp biryani exactly like this.